Christmas is coming…and a new range of seasonally themed slots are out in force! Amongst the festive slot offerings are the iconic Mexican Taco Brothers. This time they are back to help save Christmas. Could they make it a winning Christmas for you? We’ve been spinning those wheels to help you find out! Mince pies, turkey, sprouts and, er, tacos – the essential elements of any Christmas festivities. But who wouldn’t want to get the Taco Brothers involved, when they promise to provide 243 ways to save Christmas! 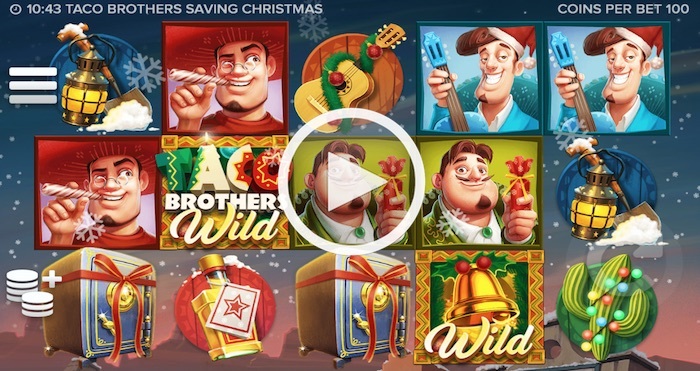 Whether you’re already familiar with the previous video game slot from the Mexican brothers or are completely new to their antics, this lively game will help get you in the seasonal spirit. The Taco Brothers are Paso, Pepe and Pico and you’ll get to meet them whilst playing this new online slot. The game consists of five reels and an array of enticing symbols to help get you fully into the Mexican Christmas spirit. There’s a bonus round to aim for in the form of the Wild Escape, plus lots of wilds, re-spins and multipliers to rev up the action. Based in Santa Maria in Mexico. The three brothers are ultimately trying to save Christmas (and tacos) from the hands of the evil Captain Diaz. You may get to meet this evil chap in the bonus round. The Taco Brothers Saving Christmas slot by Elk Studios has been expertly produced and is a lavish affair. You can expect bright, attractive colours as well as crisp, clear images. All this provides a game that plays with ease. All of the symbol images are nicely produced, with intricate details and help portray the Mexican vibe. The main parts of the symbols are essentially the same as their previous game. Featuring the familiar cacti, mining lamps, tequila, guitars and spades, but they have been given a seasonal makeover. The Christmas theme is evident from the start. All the symbols appear decorated with fairy lights, tinsel and baubles adorning guitars and shiny red bows appearing on the safe symbols. Add to that a background of falling snow and large snowflakes, and there’s no denying that this is a new Christmas online slot. The payout table is readily available at the click of a button and provides instant access to an at-a-glance guide to winning possibilities. Each of the taco brothers is represented by their own symbol, and they’re labelled, so you easily know who’s who in the band of brothers. Paso scores the highest wins (400 coins if you get five of him on a payline), followed by Pepe. The Wild symbol is a golden bell, and it’s able to replace all symbols on the reels, except the Taco Brothers Wild and the safe. Some of the top symbols to look out for are the Taco Brothers Wild, and the bow wrapped safe symbol which triggers the bonus round. As with good slot, it’s the bonus features that help set Taco Brothers Saving Christmas apart. In fact, if you’ve previously played their other video slot, it would be a bit bland without an extra bit of action to spice things up. If you get two Taco Brothers Wild symbols, it will start the re-spin feature and give you a second chance to collect three safes. 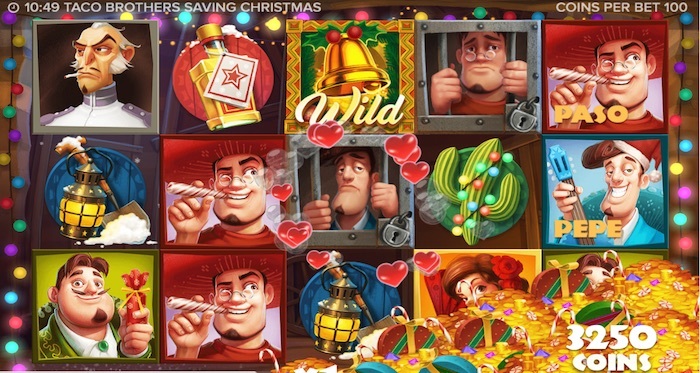 Three safe symbols are sought after as these will the Free Spins bonus game, Wild Escape. The exploded safe multiplier reveals three numbers and these will apply to all winnings on the free spins feature. Within the Wild Escape bonus feature, the brothers drop one at a time on reel five and release Running Wilds. These move across one reel per spin, from right to left, and all but two other symbols. When all the brothers have escaped, the bonus game finishes. The two other new symbols in the bonus game are Cpt Diaz, who brings out keys and imprisons any Running Wild brothers, and Senorita, who restarts Running Wilds and gives new free spins, plus helps to release imprisoned brothers. The slot has an excellent range of betting levels, 12 in fact, ranging from just 10p to £50 per spin. If you want to take advantage of it, there’s an extra feature built-in in the form of a betting strategy, something many games don’t have. There’s a potential win of up to 1500 x your original bet and the RTP of the game is 96.31%. Elk Studios have clearly given their all to the development of Taco Brothers Saving Christmas. The Mexican angle is a quirky and a bit different, which helps add to the distinctive and memorable nature of this slot and the bonus livens up play no end. With its lively music, fun characters, bright colours and fab potential wins, this is definitely a fun slot to play if you need help getting into the festive spirit.